The TSI Portacount Pro respirator fit test system includes a pair of sample tubes, the blue one samples ambient air and the clear tube attaches to the respirator and samples from inside it. A valve inside the PortaCount Pro fit tester switches from one tube to the other according to a programmed sequence. Typically, after several uses, the first few inches of the twin-tube can become fogged with moisture, as the test subject's warm breath condenses in contact to the cold walls of the tube. Occasionally, our customers ask the moisture build-up in the sample tube might affect the tests or expose employees to harm based on moisture exhaled during previous fit tests. "Exhaled moisture droplets have little effect on the PortaCount® Respirator Fit Tester for two reasons. One is that there are not enough of them to make a difference and the other is that large droplets either evaporate or impact with the walls of the sample tube before they reach the PortaCount fit tester. If a body-generated droplet were to be counted by the PortaCount fit tester, the result would be a fit factor that is lower than it should be. There is no possibility of overstating the fit factor." As to the concerns over employee exposure, TSI has issued an application note: Hygienic Security and the Portacount Respirator Fit Tester. In it, TSI states that air drawn into the the Portacount twin-tube always travels from the test respirator toward the fit tester or is stopped. It isn't possible for the respirator wearer to inhale with sufficient force to reverse the air flow direction [to expose themselves to moisture from a previous test]. The application note does suggest having multiple twin-tubes available during testing, so you can swap them out between uses and avoid moisture buildup. If you don't have multiple tubes available, however, you can rinse the tubes with Isopropyl alcohol, then shake or spin the tube to remove the excess. The alcohol will absorb the moisture and dry quickly, and will help keep your sample tubes clean between tests. 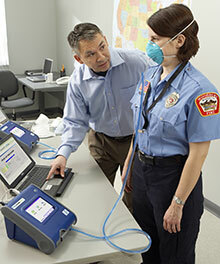 Read my other posts about respirator fit testing.